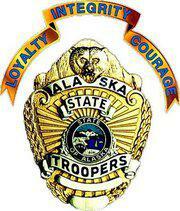 Alaska State Troopers arrested an armed man after a standoff on the Sterling Highway Sunday. Police took Soldotna resident Todd Bashaw into custody after the incident took place Sunday morning around mile marker 131 near Ninilchik. According to a troopers dispatch, officers received reports that Bashaw blocked the northbound lane. Police say he allegedly brandished weapons, including a revolver and a pump-action shotgun, when motorists tried to assist him. After responding, troopers say they shut down the highway and tried to negotiate with Bashaw, who they say made suicidal comments. Captain Maurice Hughes is the detachment commander on the Kenai Peninsula. “We ended up bringing our PRV tactical response vehicle down to the location so that we could safely get into a location where we could communicate freely with the individual in the vehicle,” he said. Hughes says Bashaw told officers on the scene that he wanted them to leave. He said Bashaw got out of the car roughly 15 to 20 minutes after they deployed the gas. Police say Bashaw allegedly stole the firearms in the vehicle from a Ninilchik resident Saturday evening. Troopers charged Bashaw with three counts of assault, two counts of theft and disorderly conduct. Police reopened a single lane on the highway early Sunday afternoon and both lanes were opened shortly afterwards. This story has been updated with information and quotes from Captain Maurice Hughes.